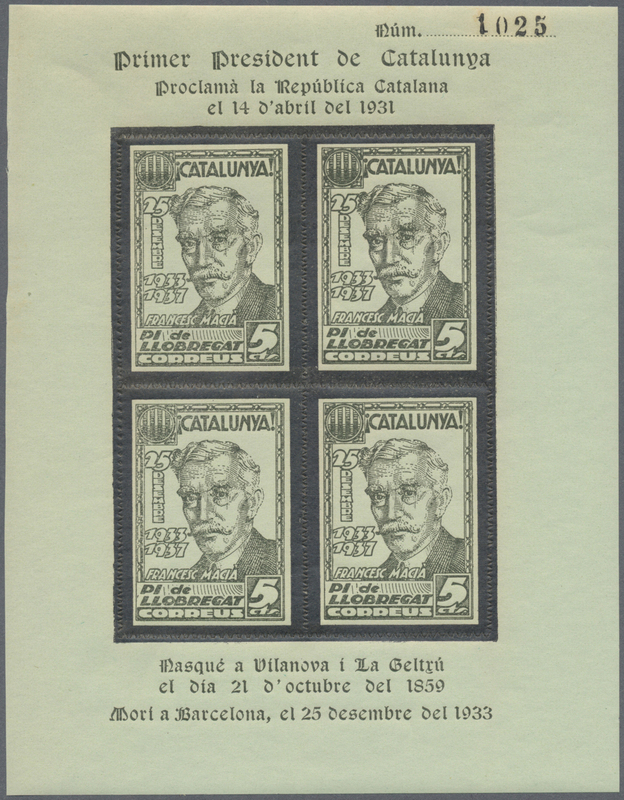 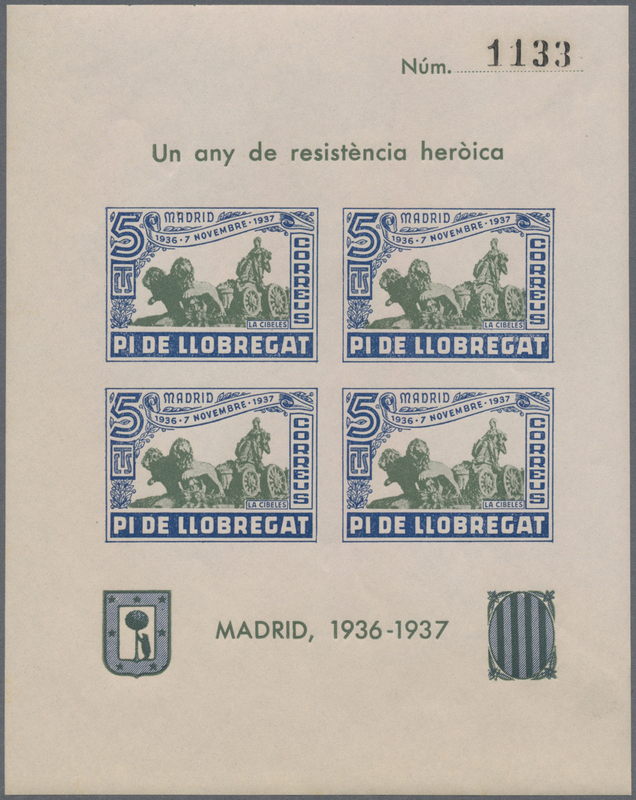 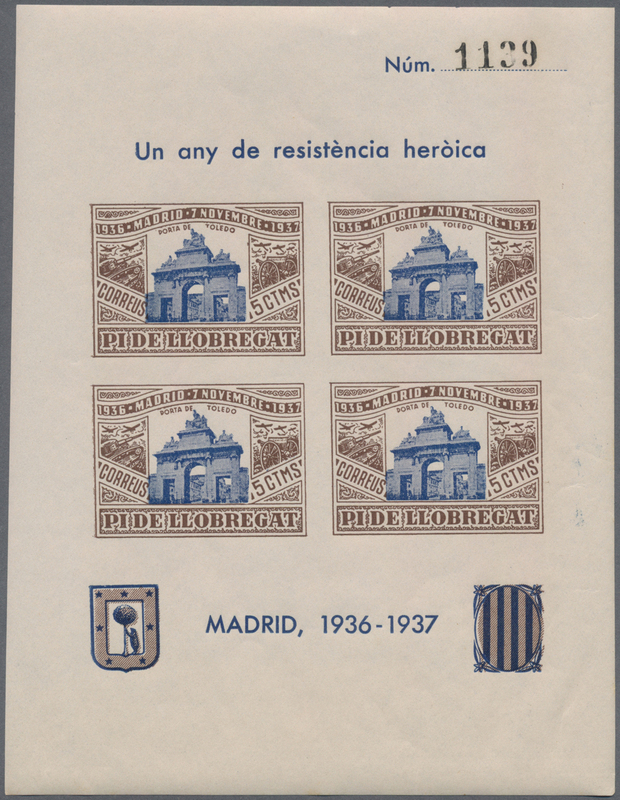 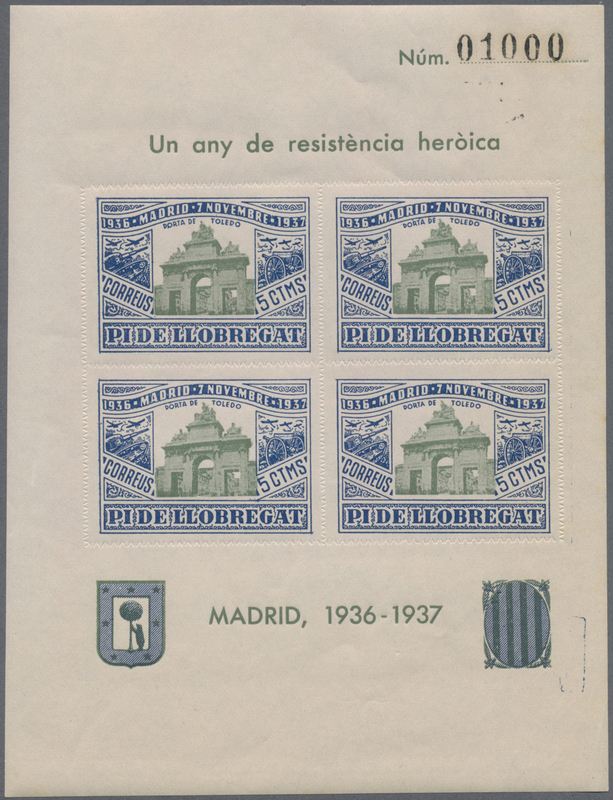 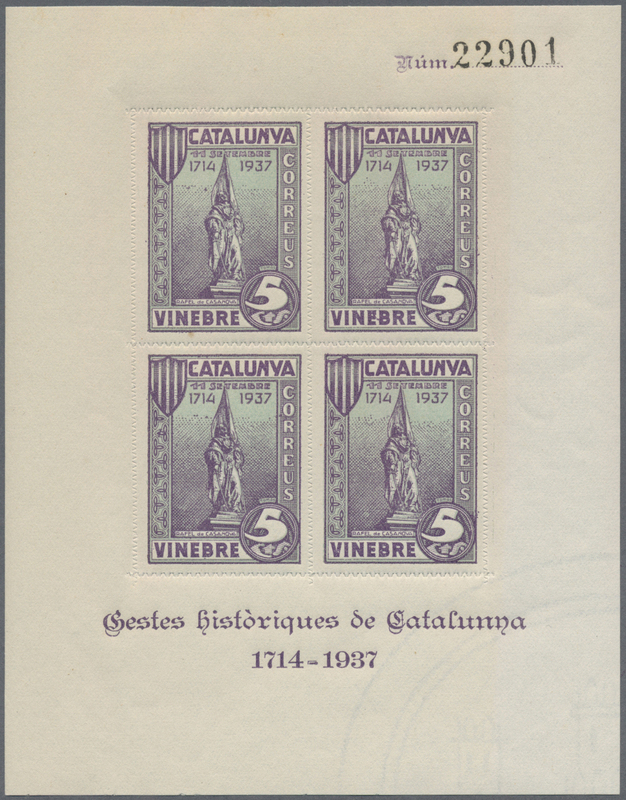 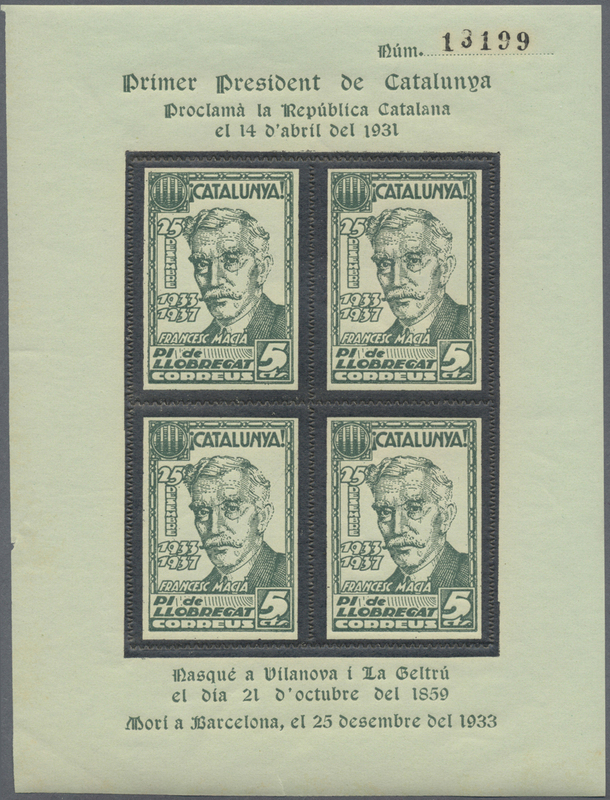 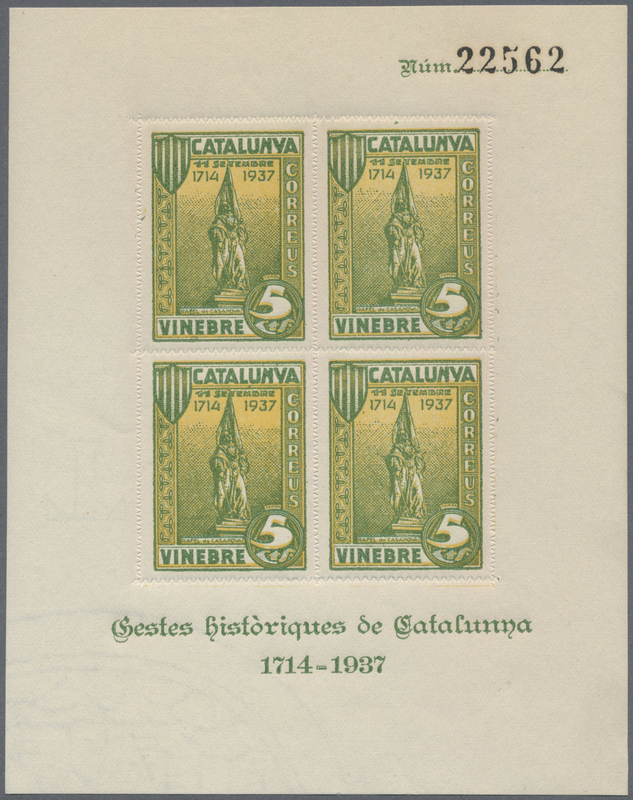 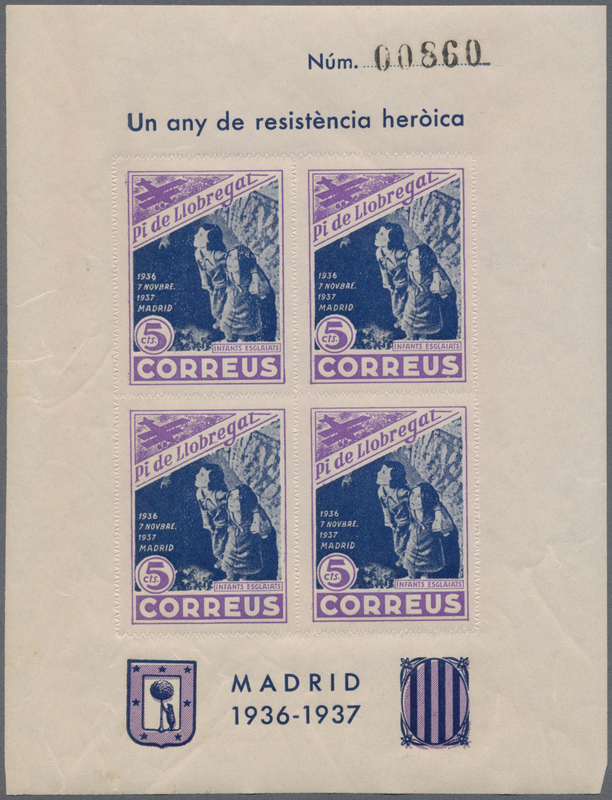 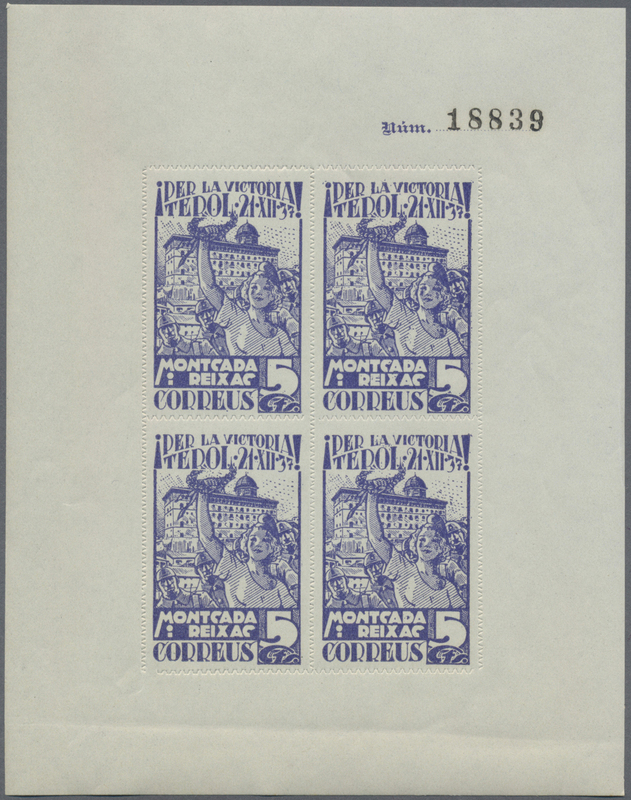 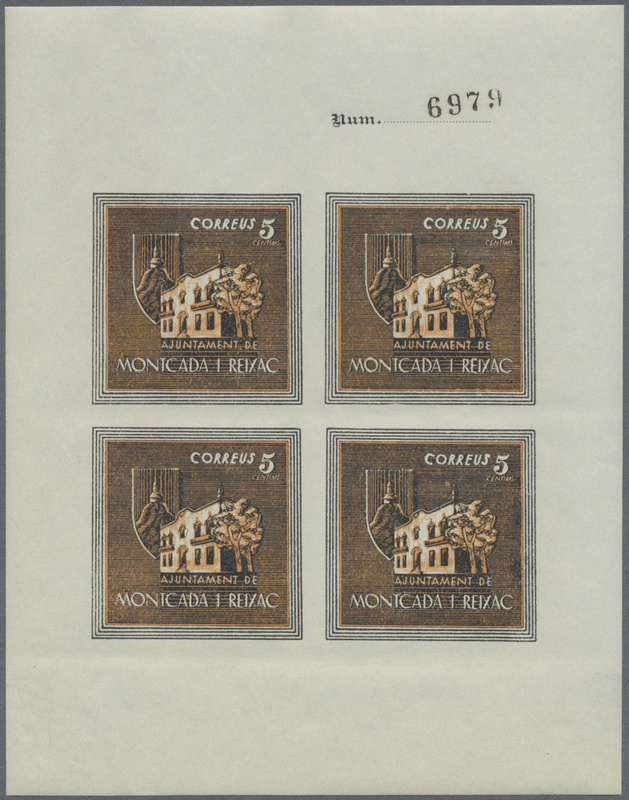 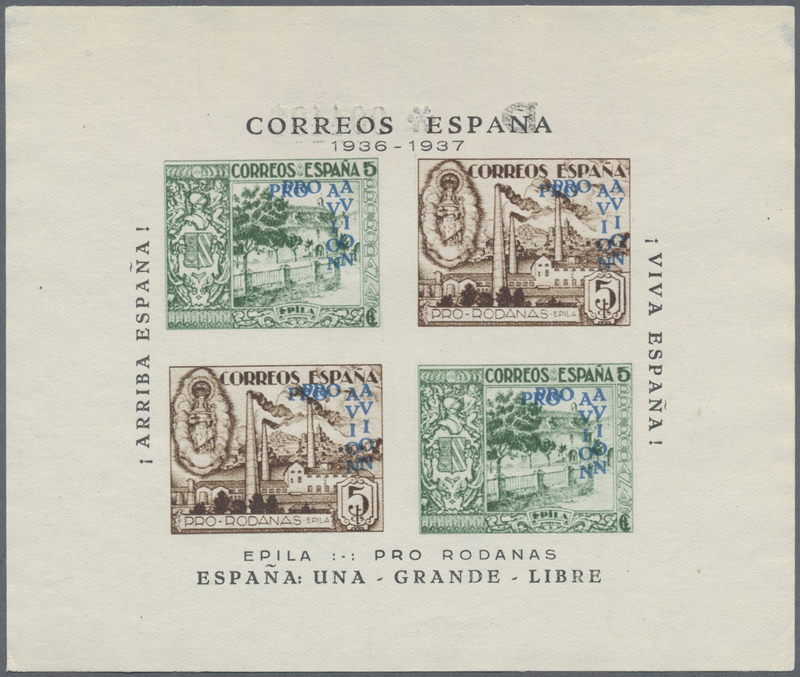 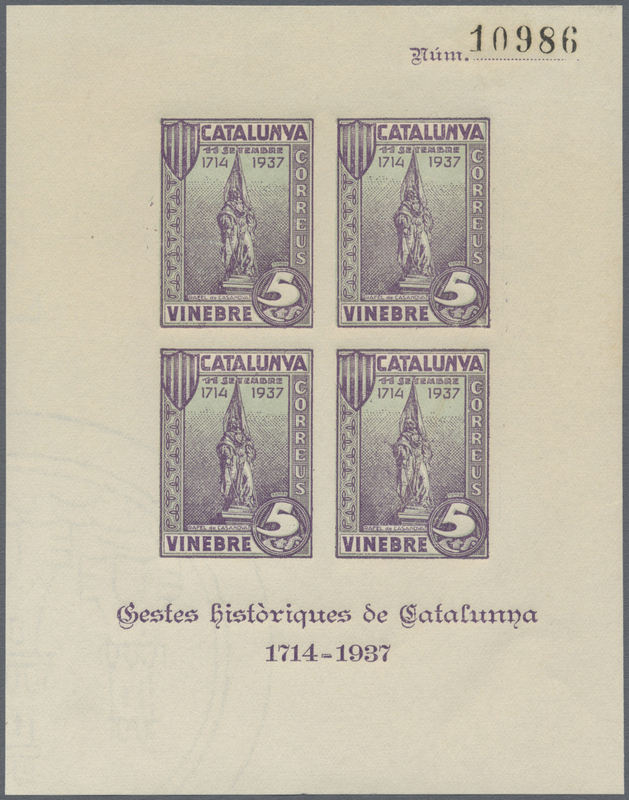 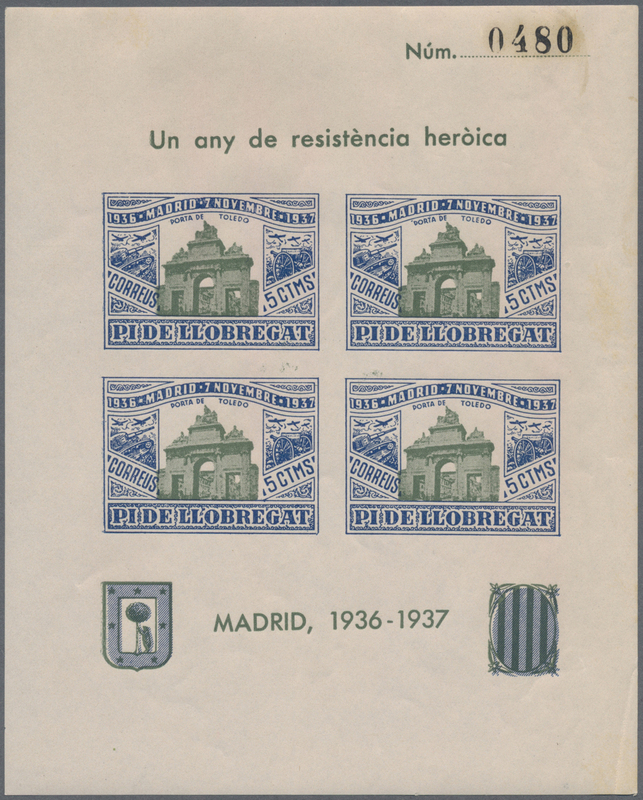 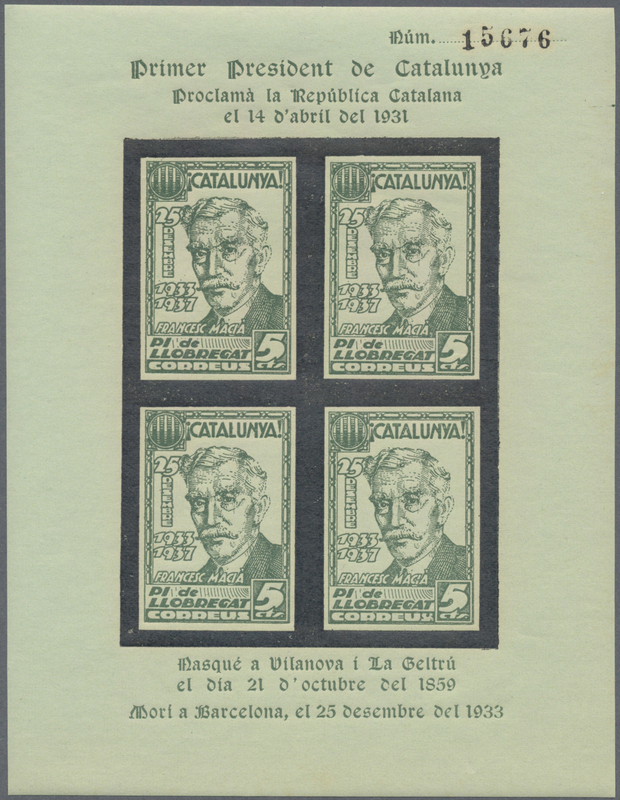 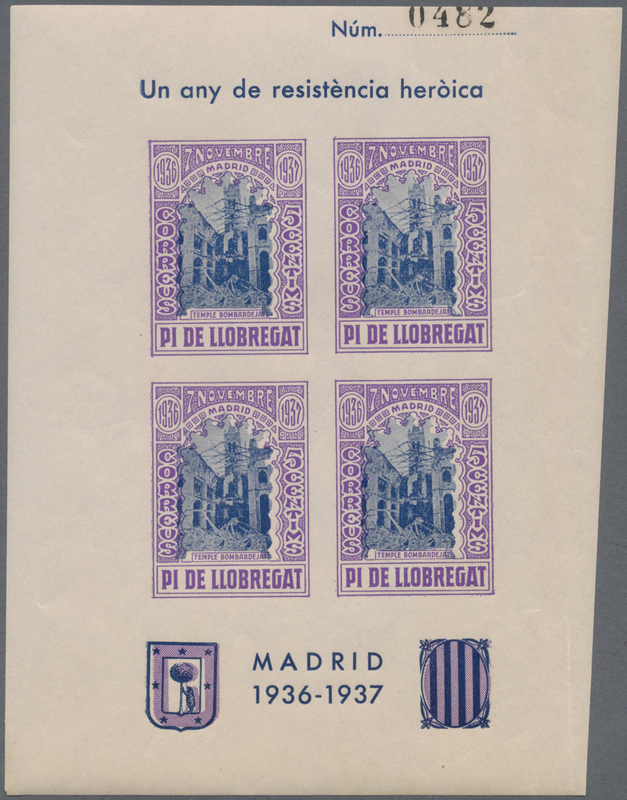 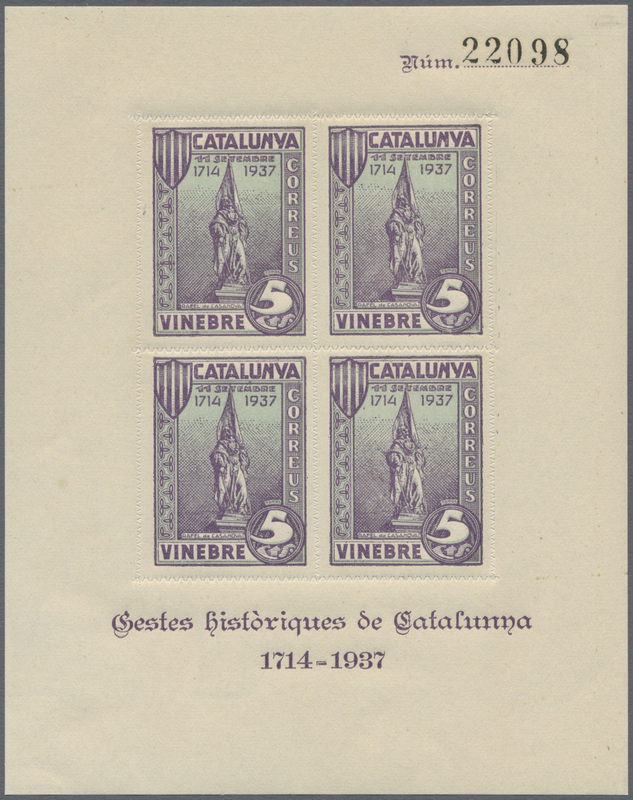 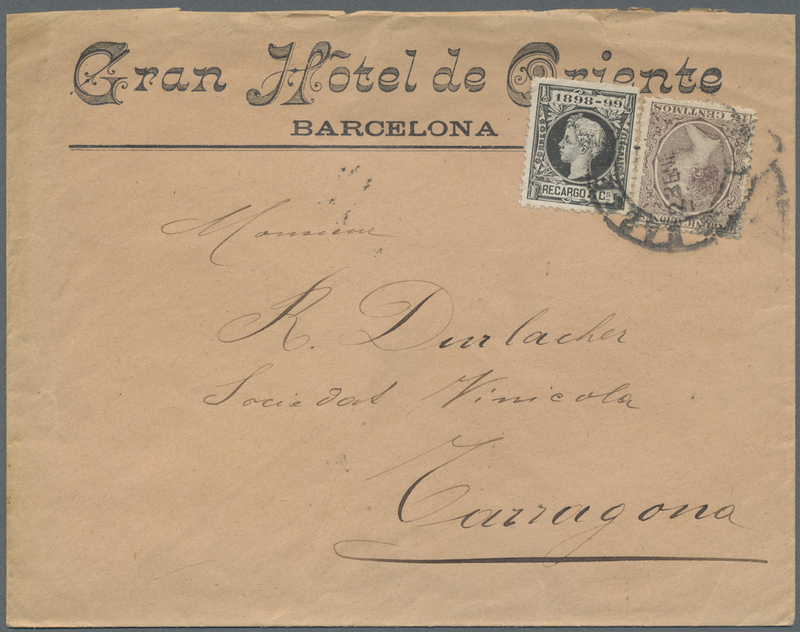 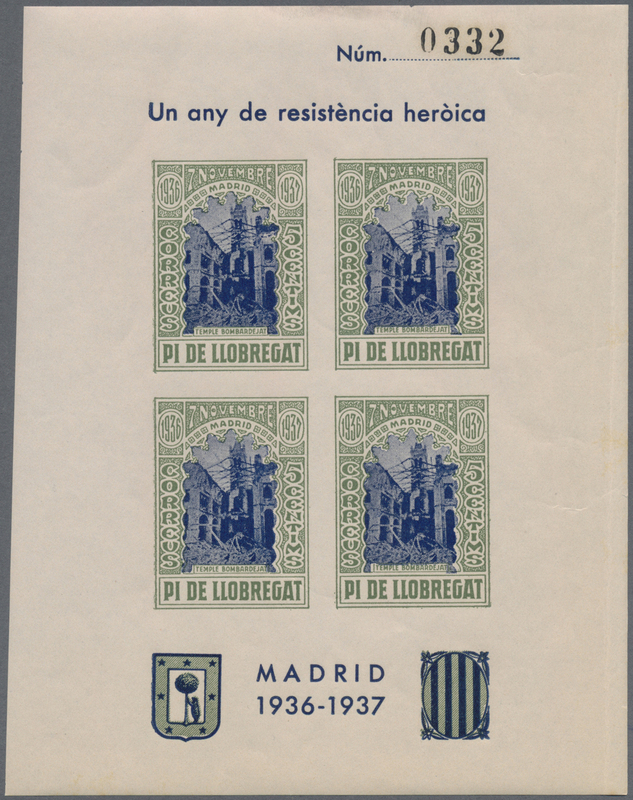 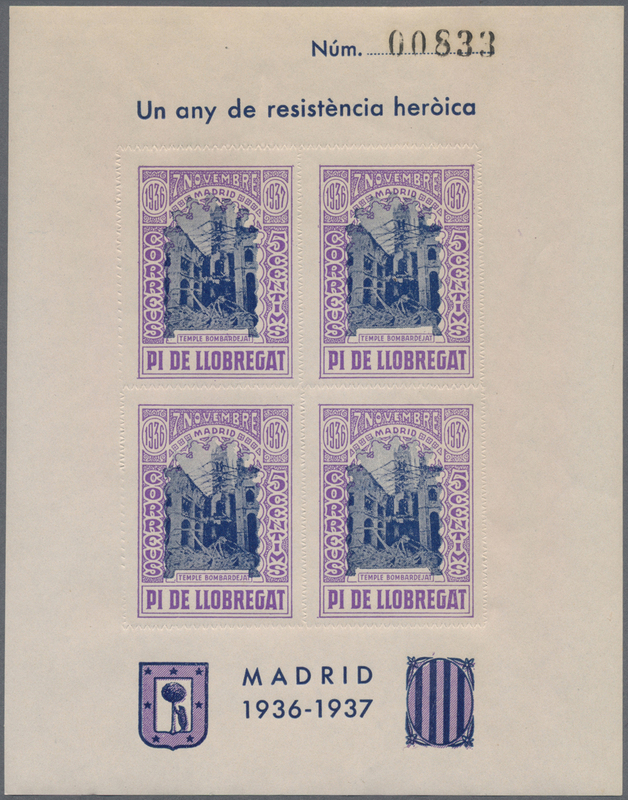 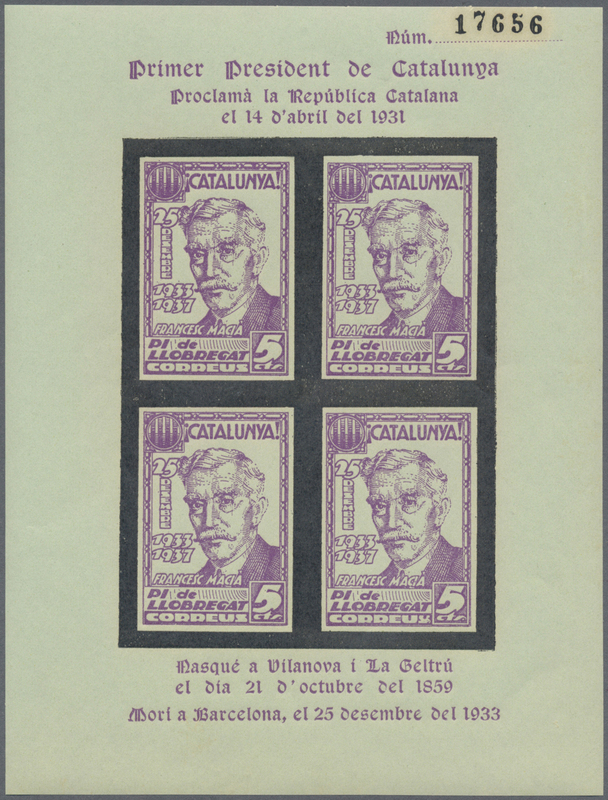 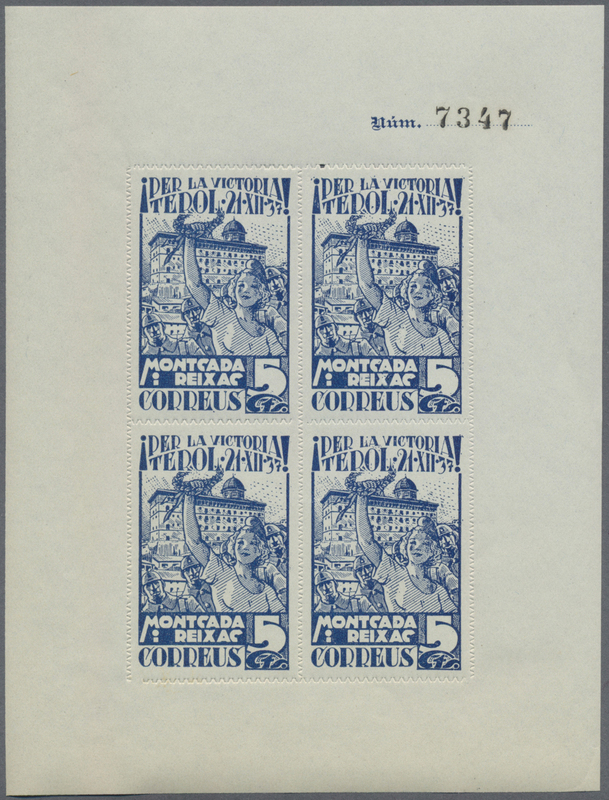 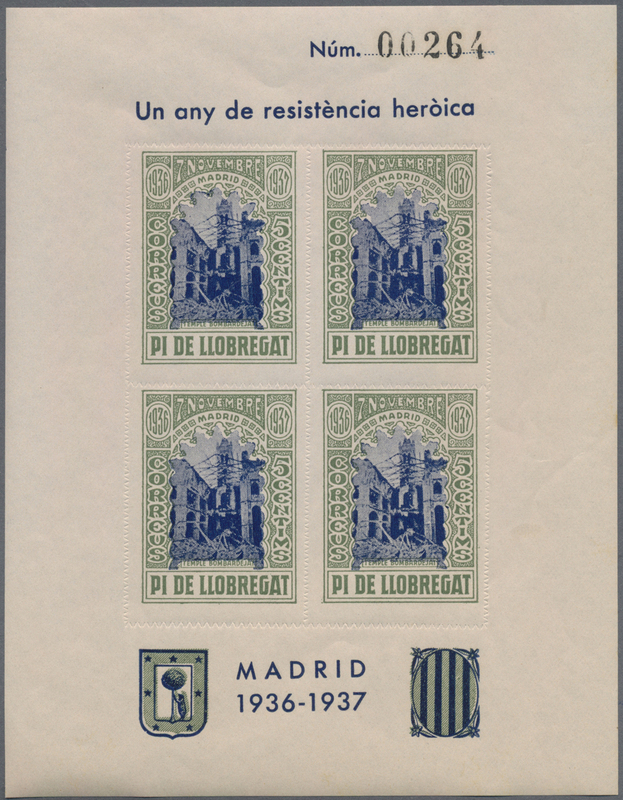 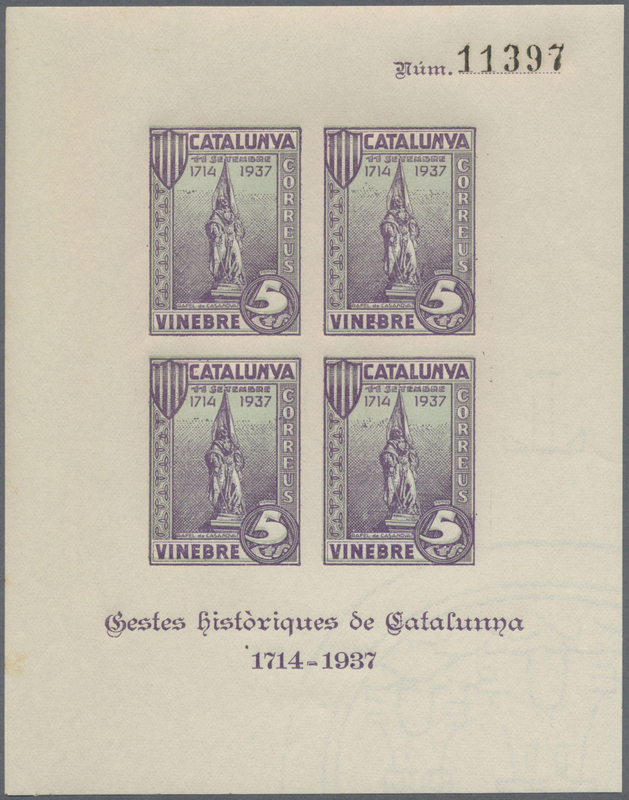 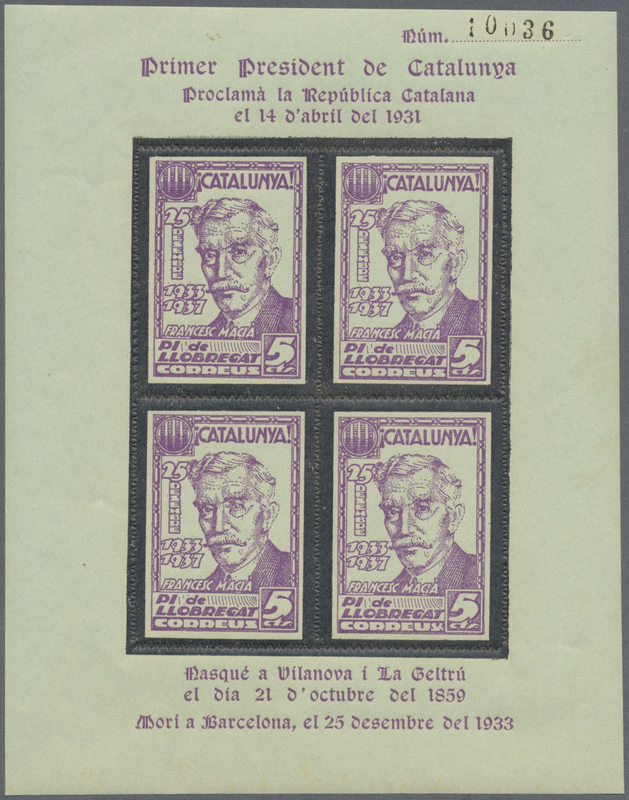 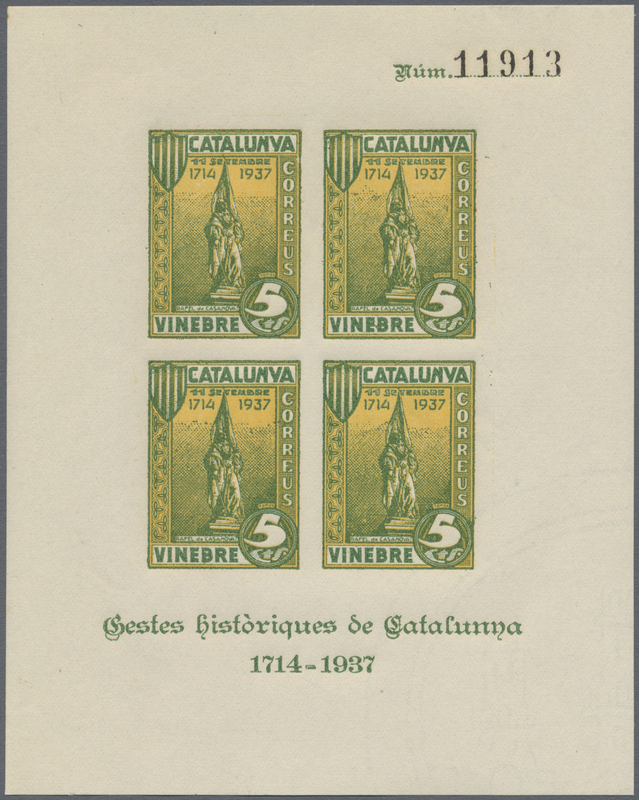 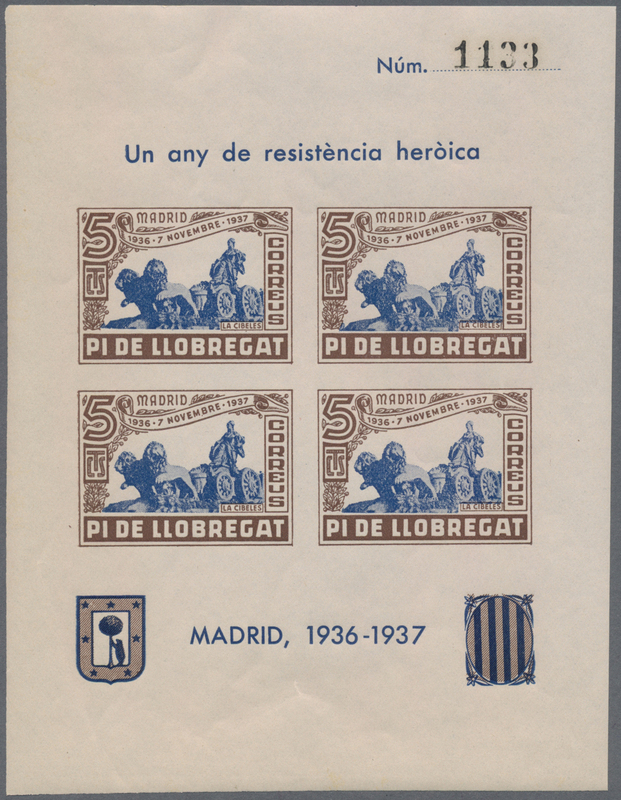 14891 postfrisch (never hinged) ** Pi de Llobregat (Cat 1937, PI DE LLOBREGAT (Catalunya): accumulation with about 550 IMPERFORATE miniature sheets ‚Rafel de Casanova‘ (Festa Nacional de Catalunya) 5c. 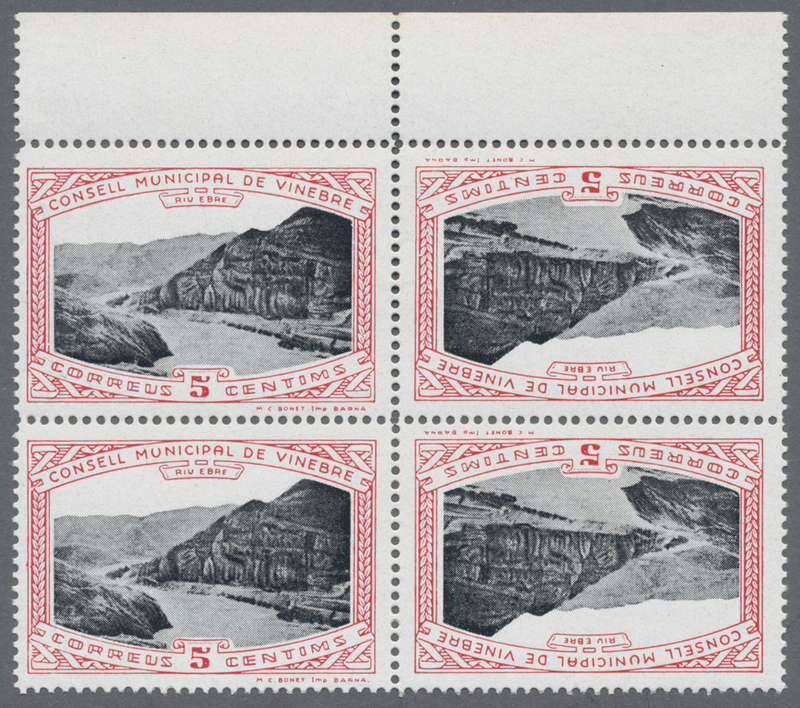 black on cream paper numbered on front, mint never hinged but some with gum problems/toning or minor blemishes nevertheless a very unusual and scarce lot! 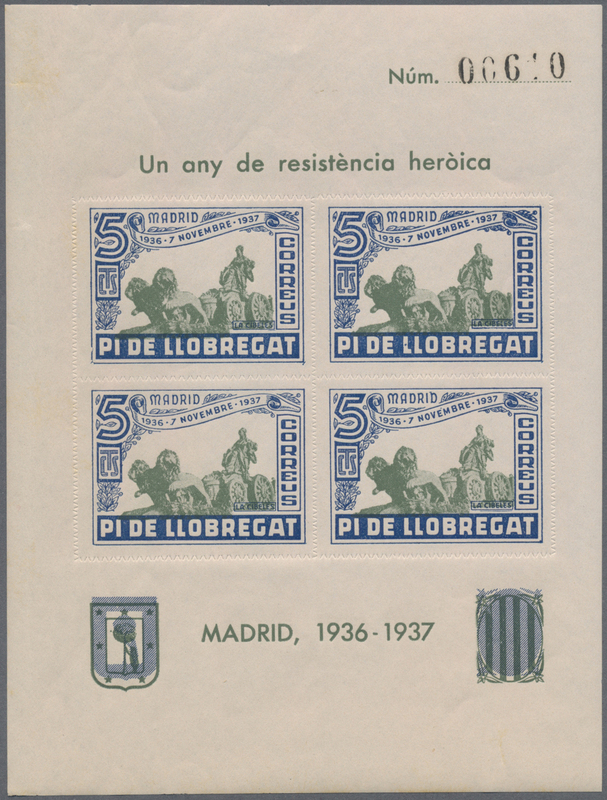 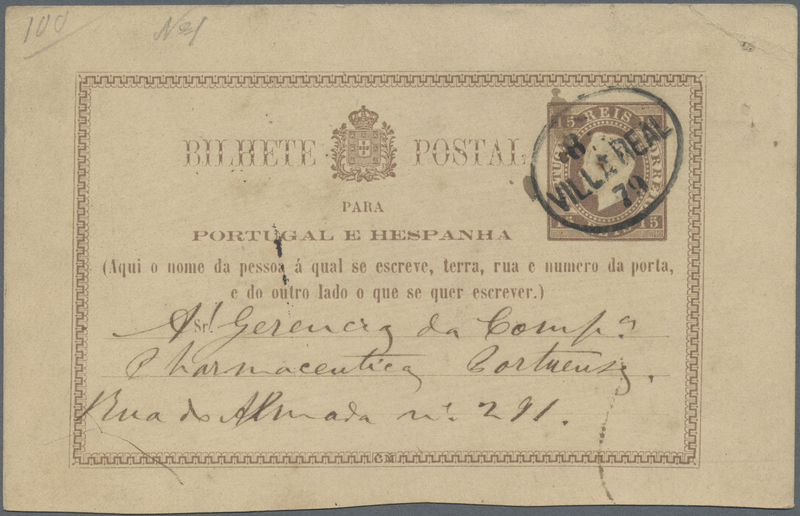 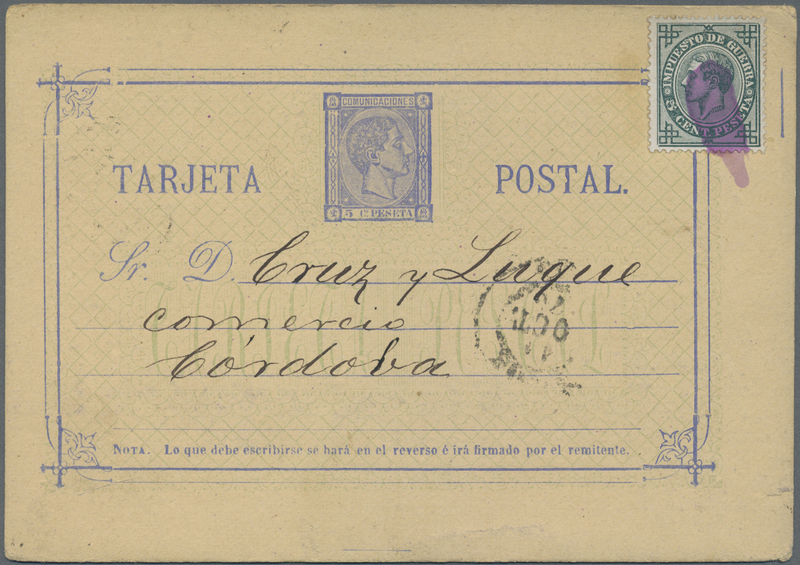 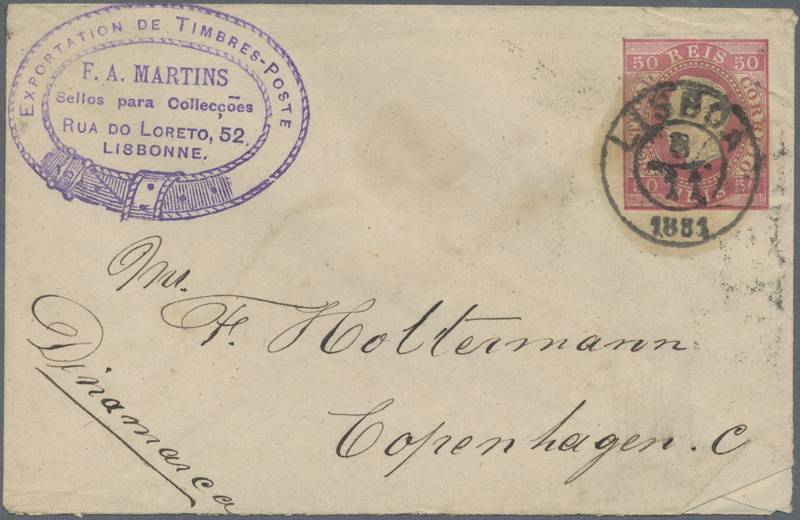 14892 postfrisch (never hinged) ** Pi de Llobregat (Cat 1937, PI DE LLOBREGAT (Catalunya): accumulation with approx. 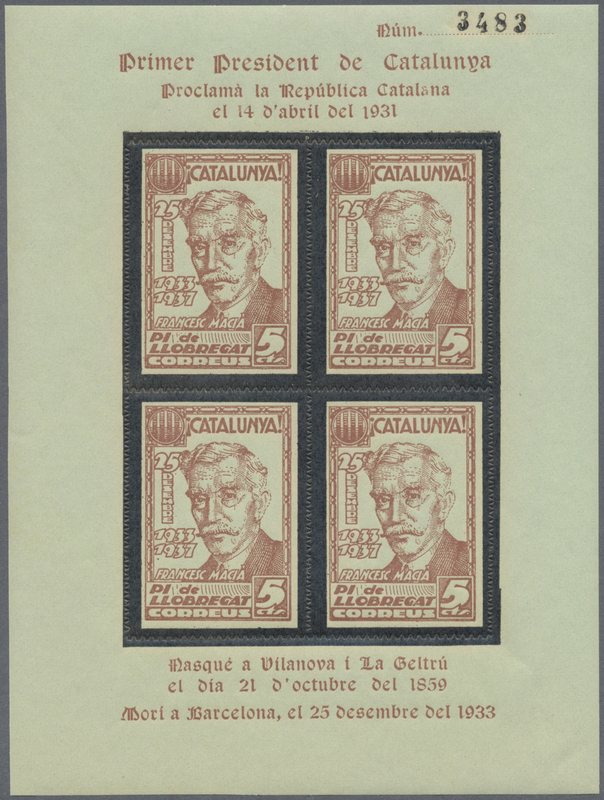 1.200 perforated stamps ‚Rafel de Casanova‘ 5cts. 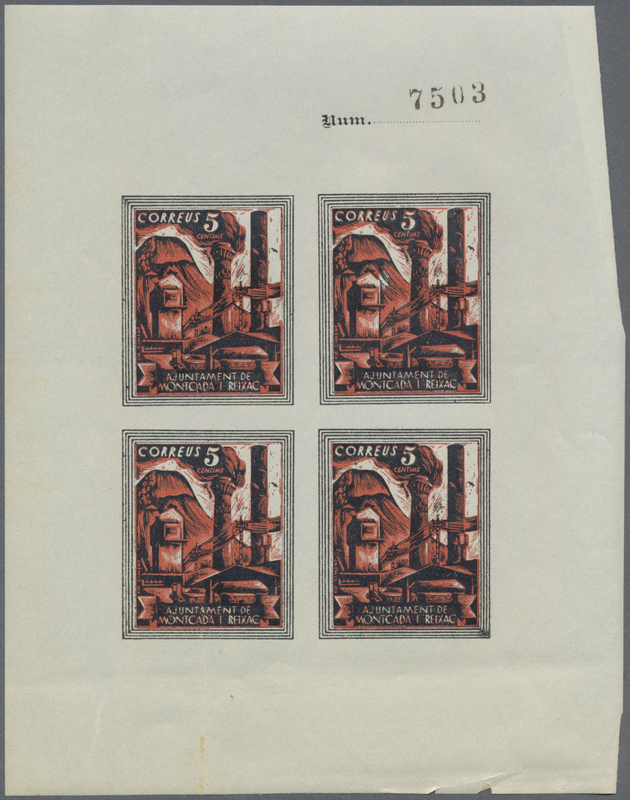 brown incl. 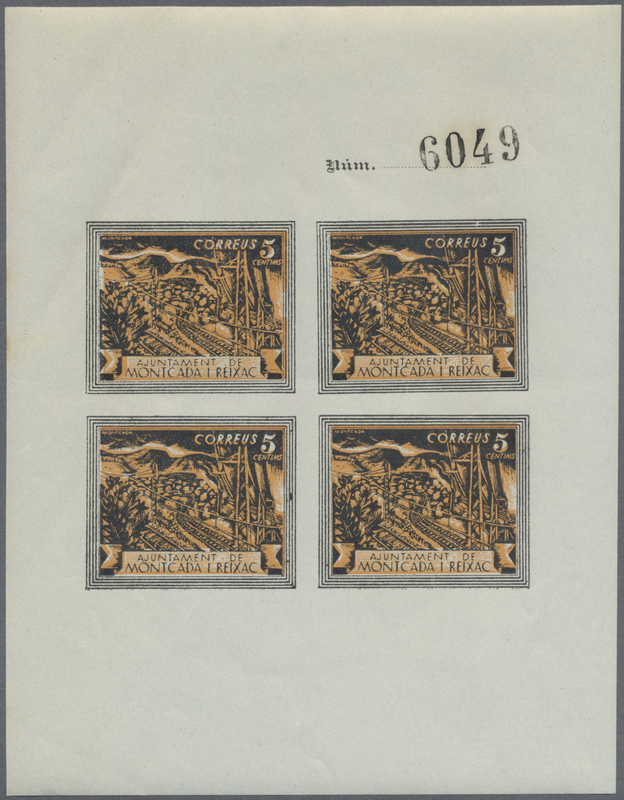 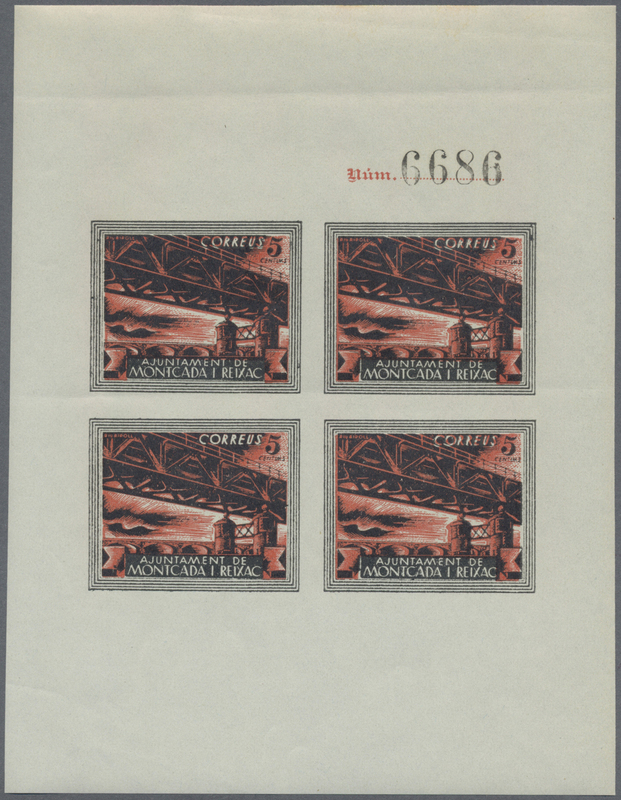 many large blocks/part sheets, mint never hinged incl. a few with some gum problems etc., unusual and scarce lot! 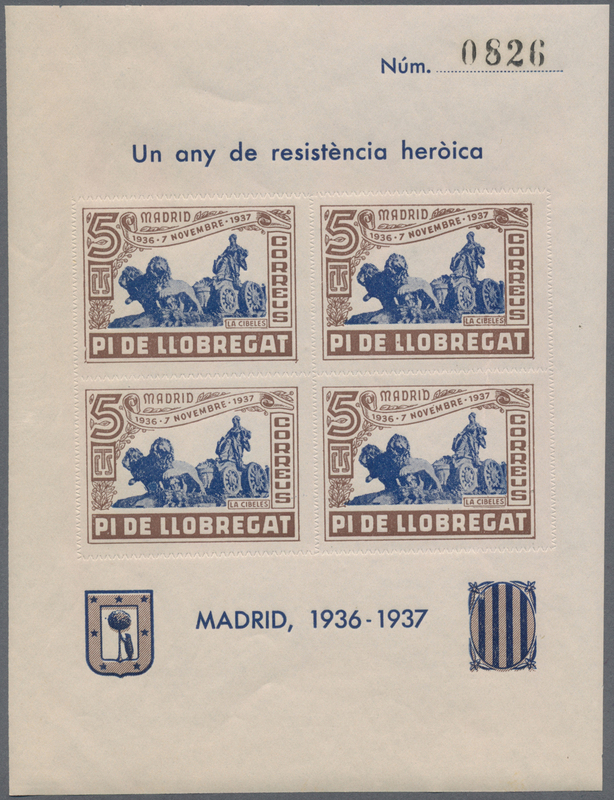 14893 postfrisch (never hinged) ** Pi de Llobregat (Cat 1937, PI DE LLOBREGAT (Catalunya): accumulation with approx. 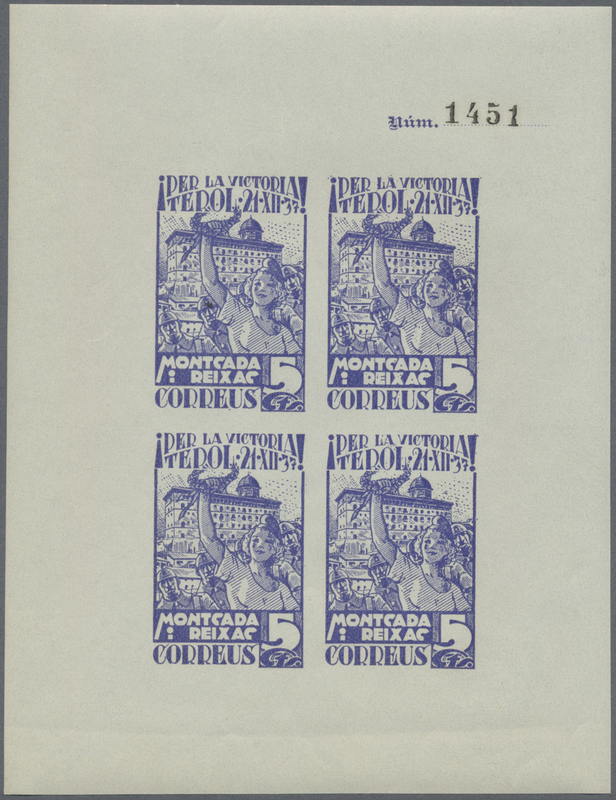 1.300 perforated stamps ‚Corpus de Sang‘ 5cts. 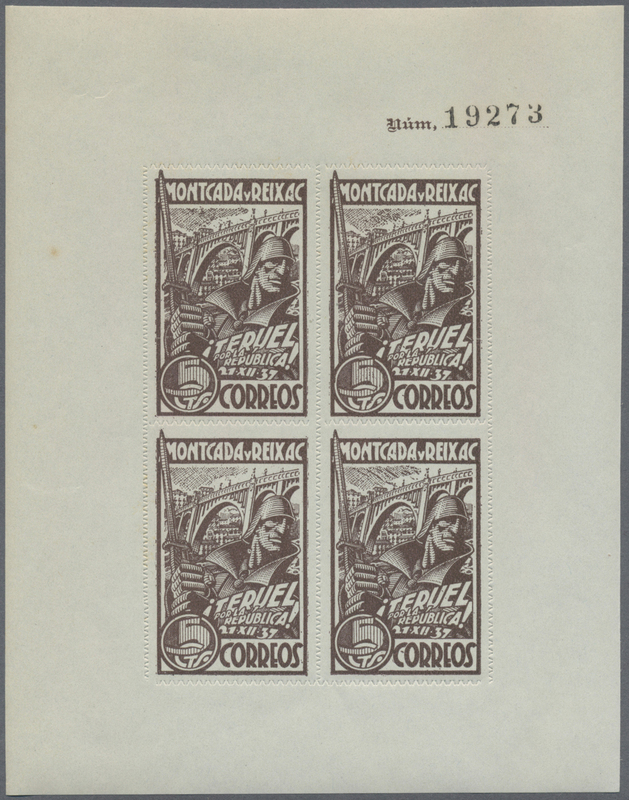 black incl. 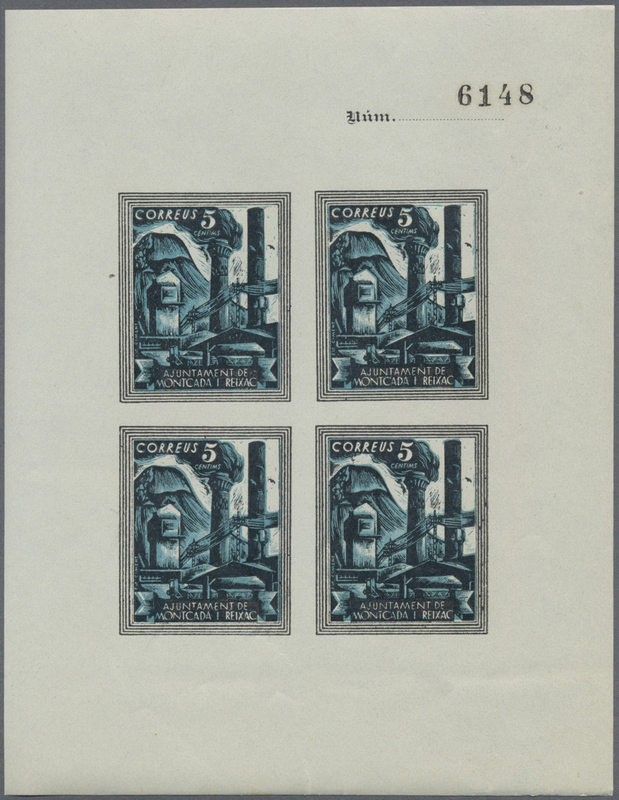 many large blocks/part sheets, mint never hinged incl. 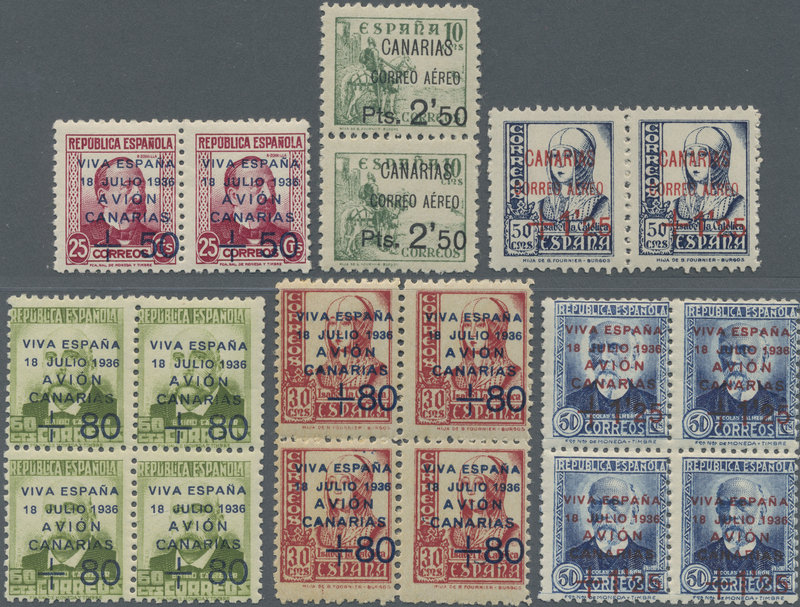 a few with some gum problems etc., unusual and scarce lot! 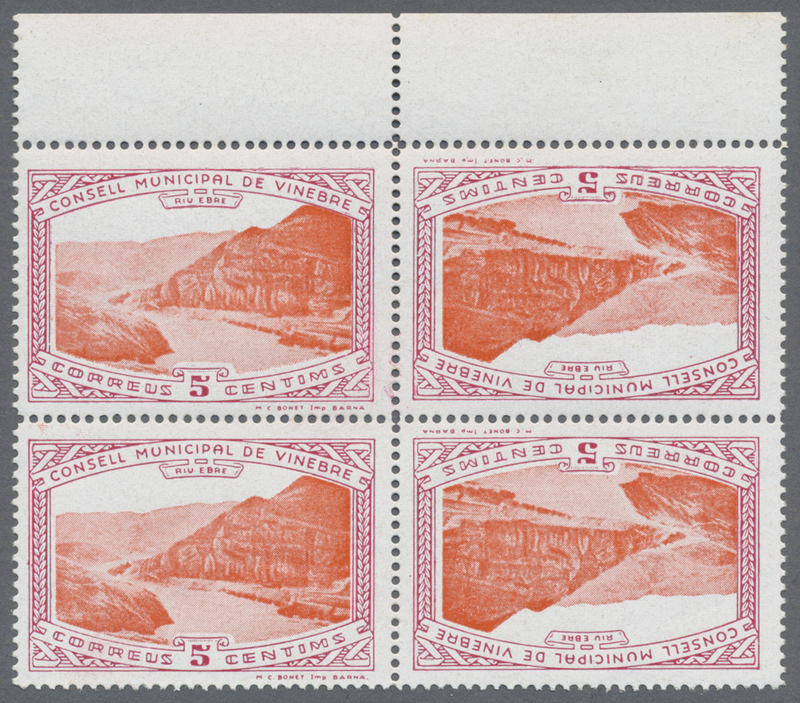 14897 postfrisch (never hinged) ** Vinebre 1937, VINEBRE: accumulation of two different zig-zag rouletted stamps ‚Rafel de Casanova‘ 5cts. 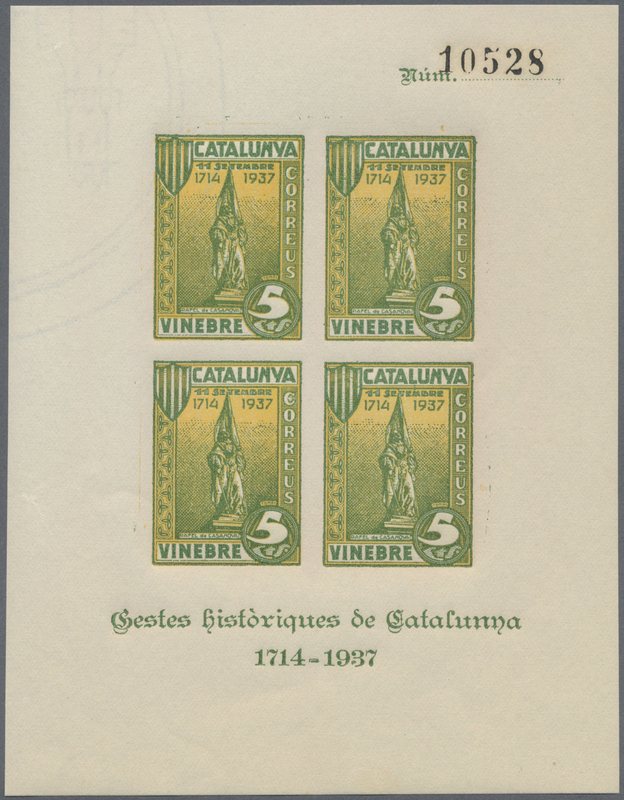 green/grey and 5cts. 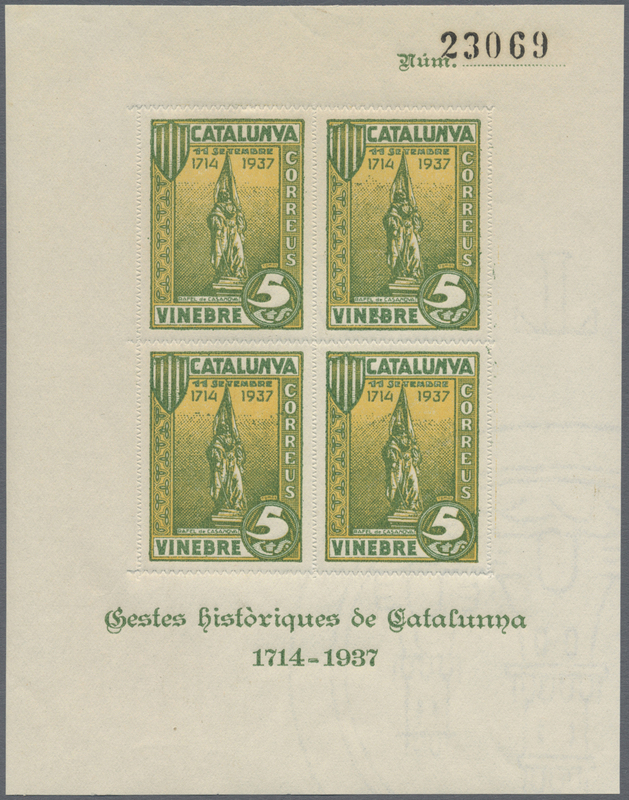 brown/yellow in an investment lot with about 2.600 sets of two with a large quantity in complete (folded) sheets, mint never hinged incl. 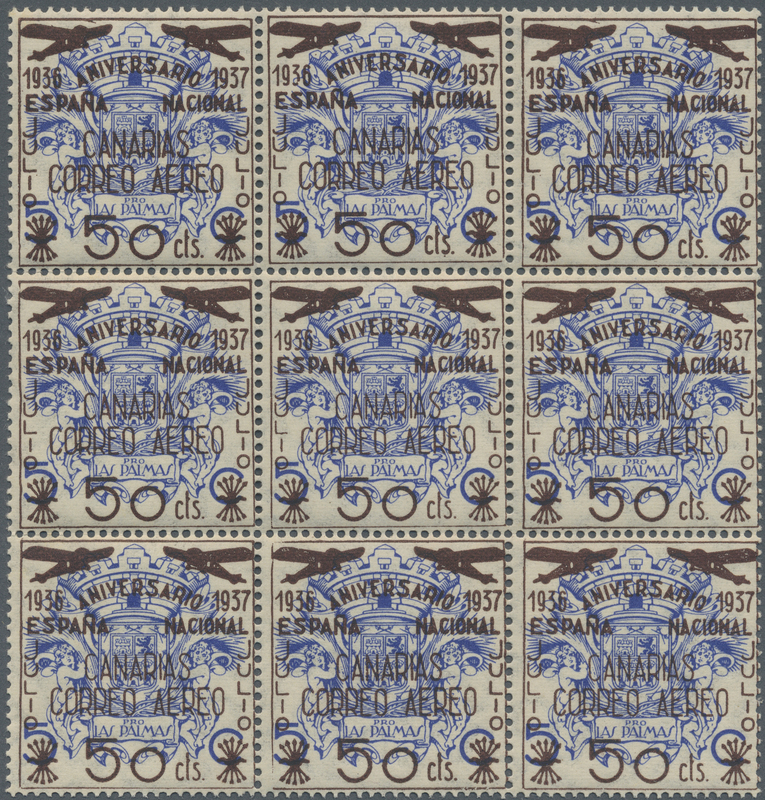 a few with some gum problems etc., unusual and scarce lot! 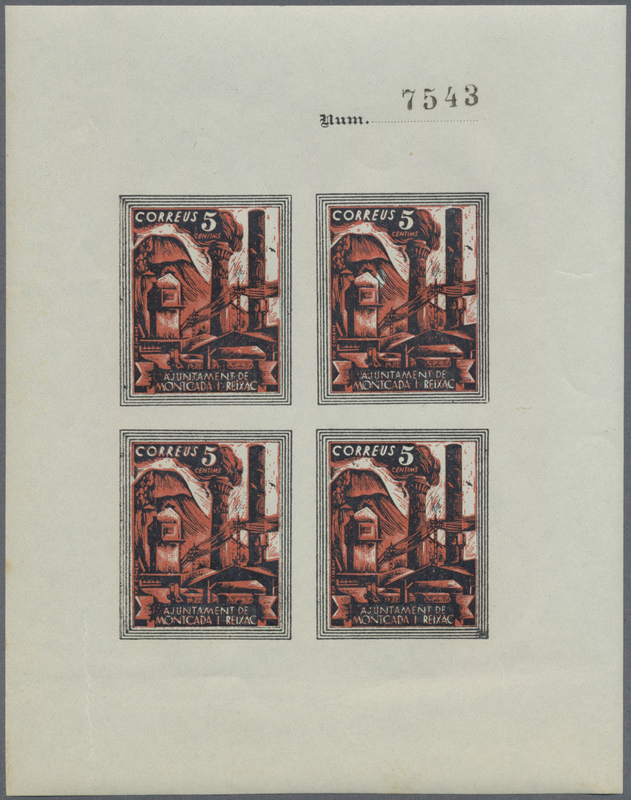 14913 postfrisch (never hinged) ** fiscals 1930 (ca.? 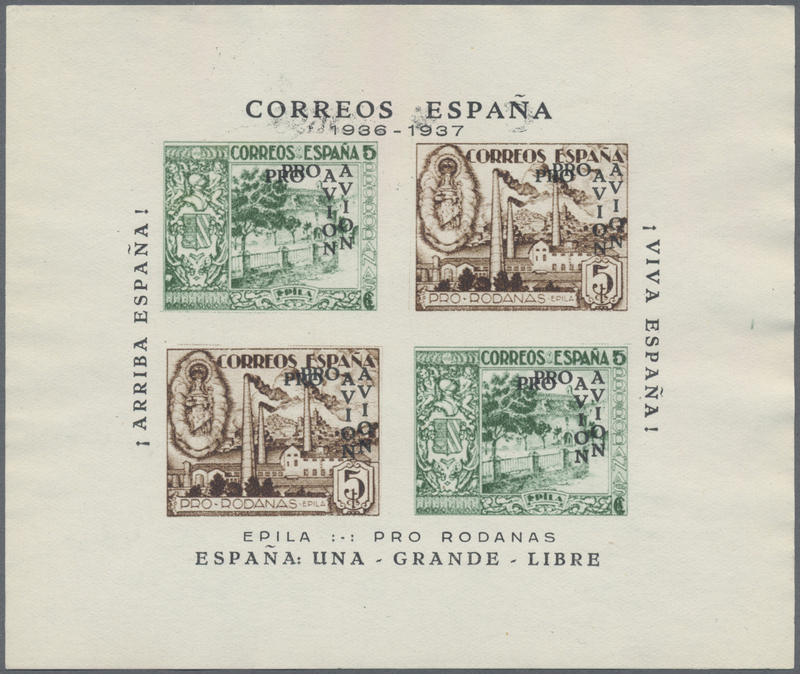 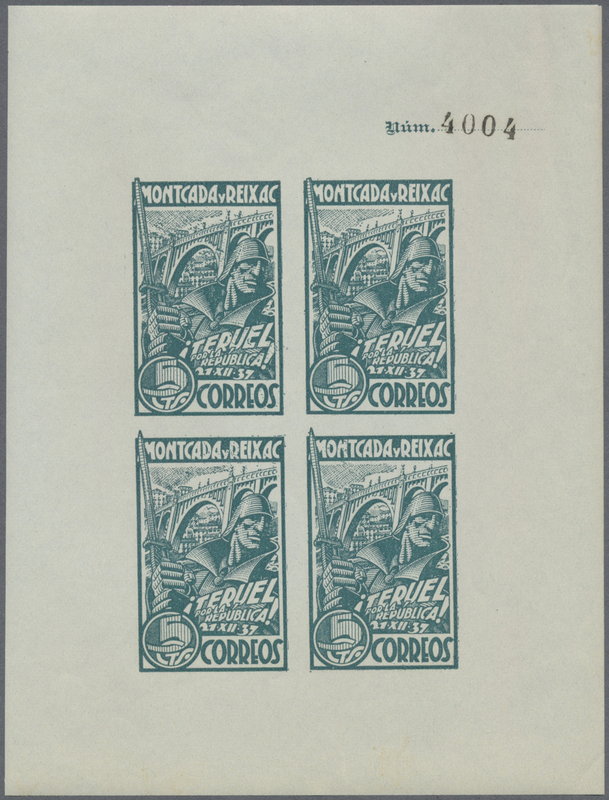 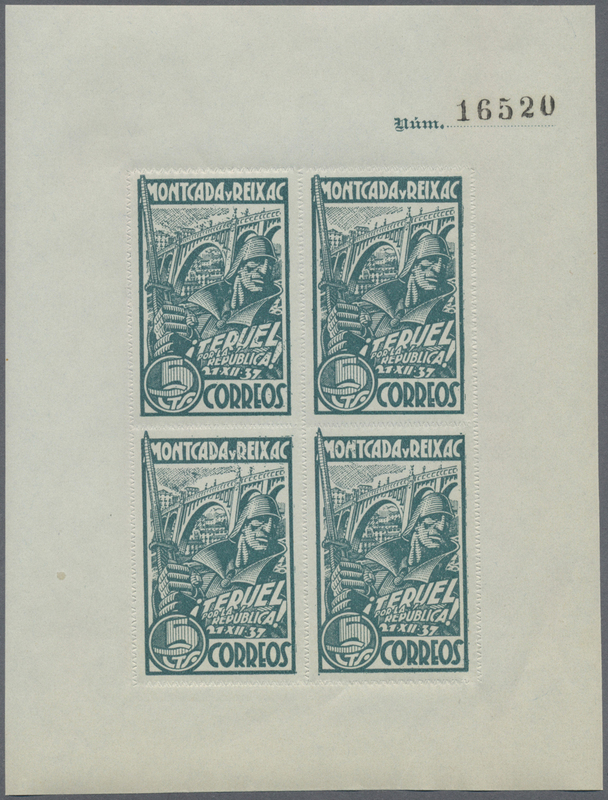 ), fiscal stamp issue 'ESPECIAL PARA FACTURAS Y RECIBOS' 15 CTS grey-green with black control-number on reverse in a lot with approx. 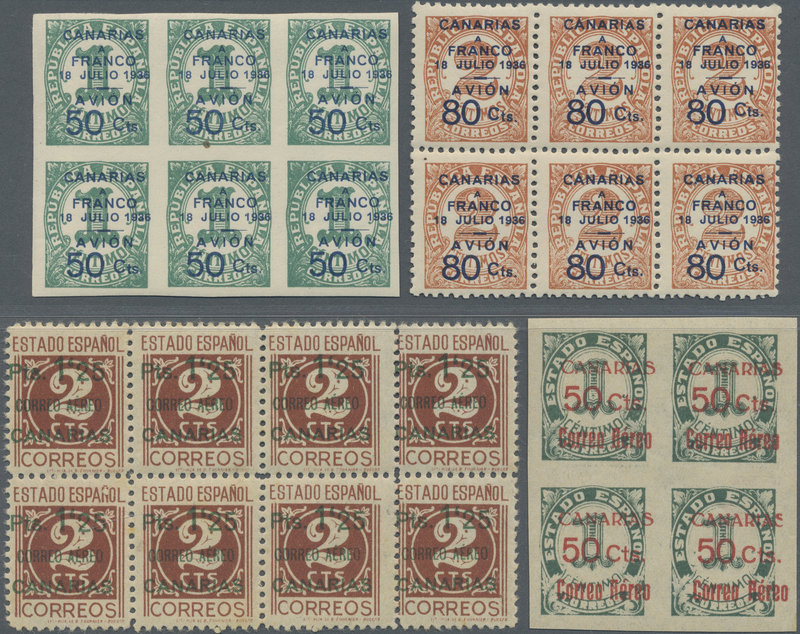 1.000 stamps mostly in larger blocks, mint never hinged, unusual investment lot! 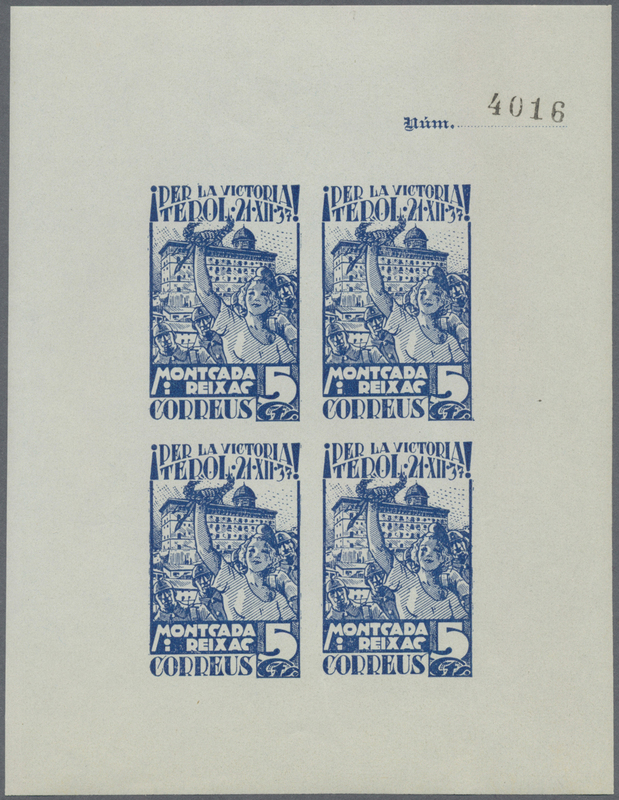 14914 postfrisch (never hinged) ** fiscals 1930 (ca.? 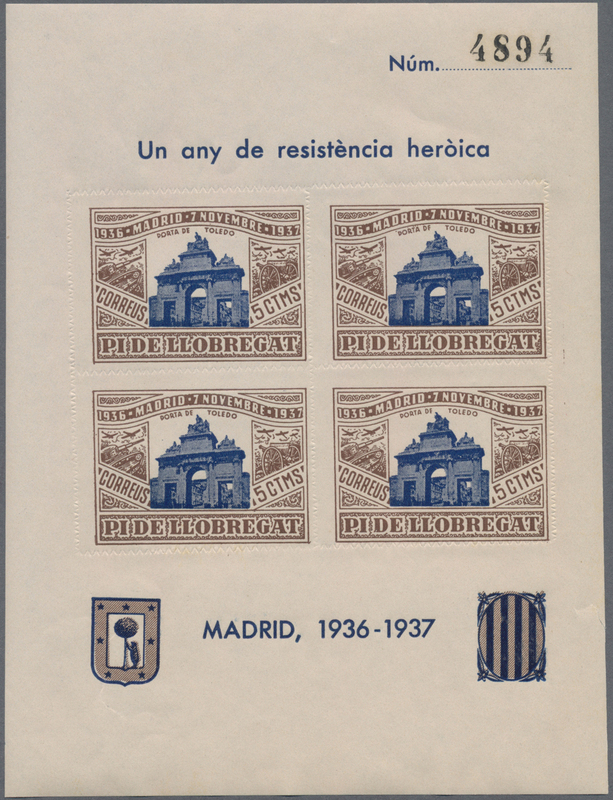 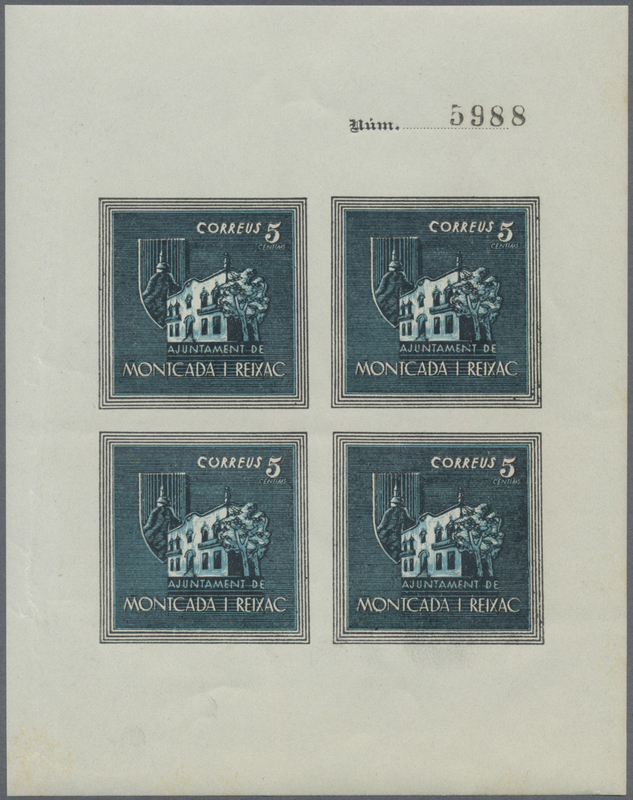 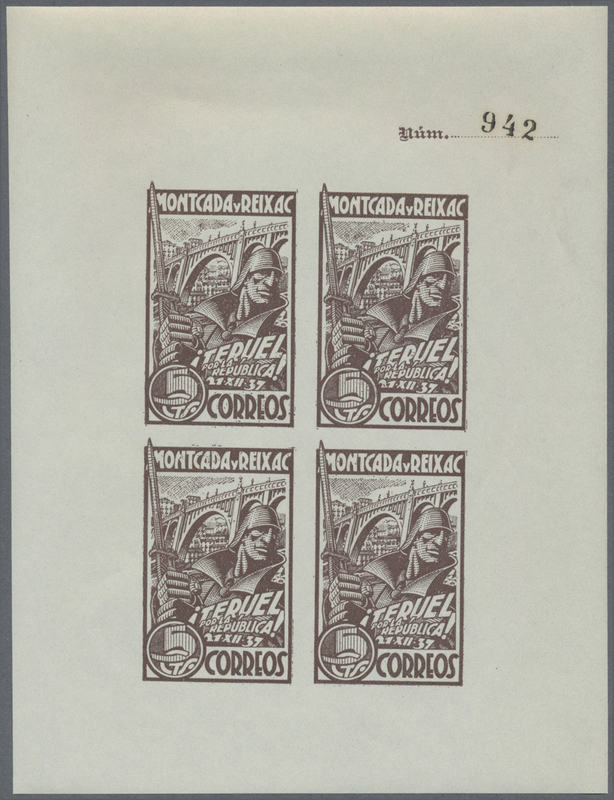 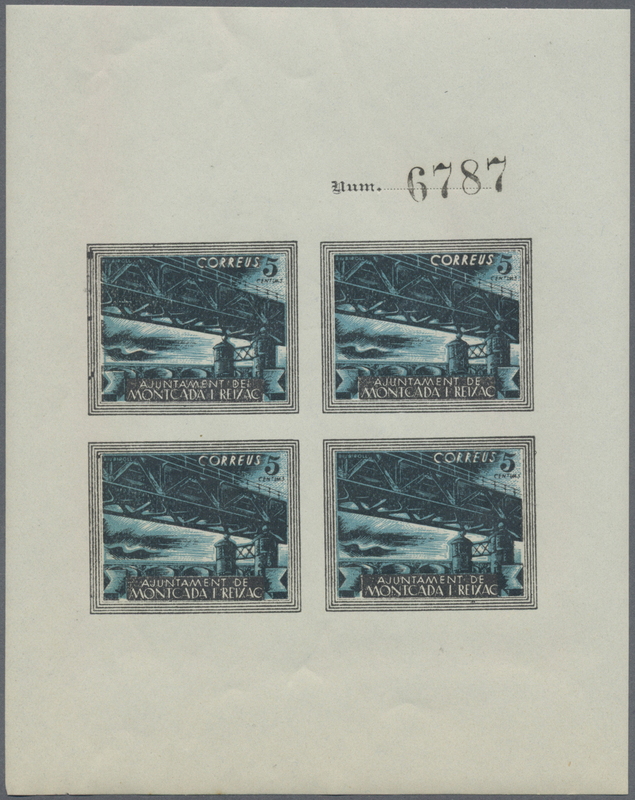 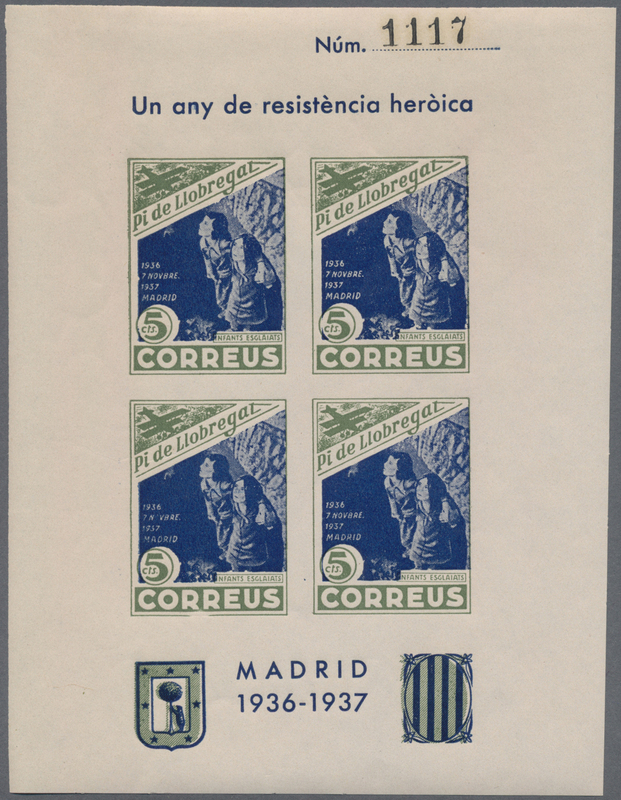 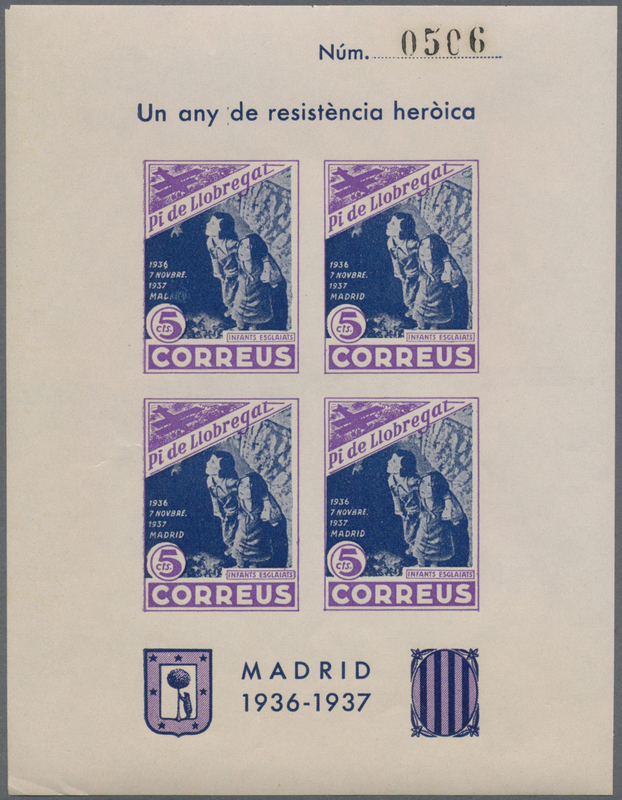 ), fiscal stamp issue 'TIMBRE PARA FACTURAS' 25 Centimos pale blue with blue control-number on reverse in a lot with approx. 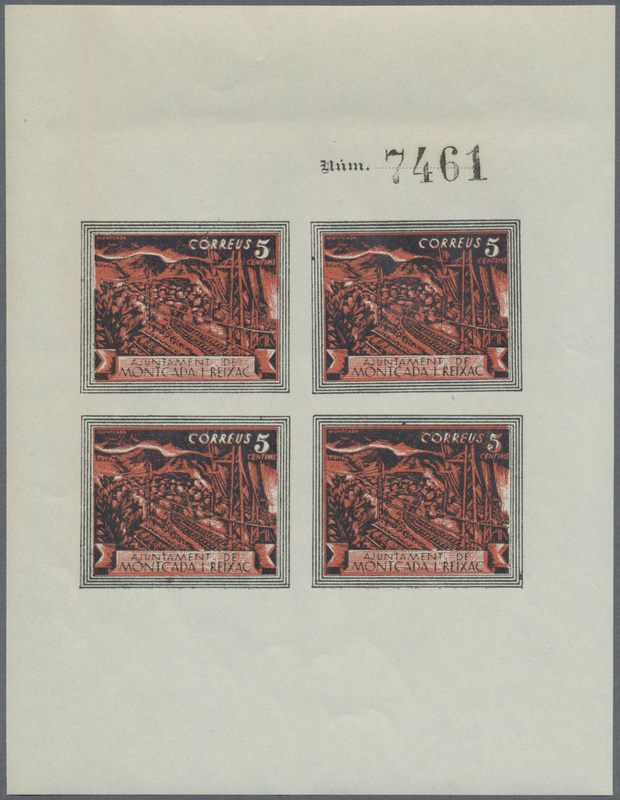 1.500 stamps mostly in larger blocks/part sheets, mint never hinged, unusual investment lot!